The bloody dawn of the Legends... Expansion #1 for Mythic Battles includes new units and allows players to strengthen their armies while competing in six new epic battles. He also introduced a new type of card: Les Héros. Discover new contents and new rules, for even more mythical battles: New warriors, with talents never before seen, come to inflate the armies of Hades as well as Athena. New tiles project battles into ever more hostile and exotic environments. New scenarios offer players tense challenges that exploit the slightest subtleties of the rules of the game. Finally, exceptional beings with superhuman powers offer their services to both armies: they are the Heroes! Be careful this game is an extension of Mythic Battles and cannot be played alone. 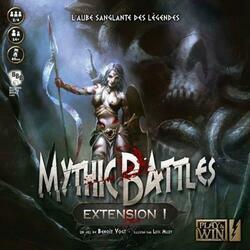 To be able to play it you must have a copy of the game Mythic Battles .